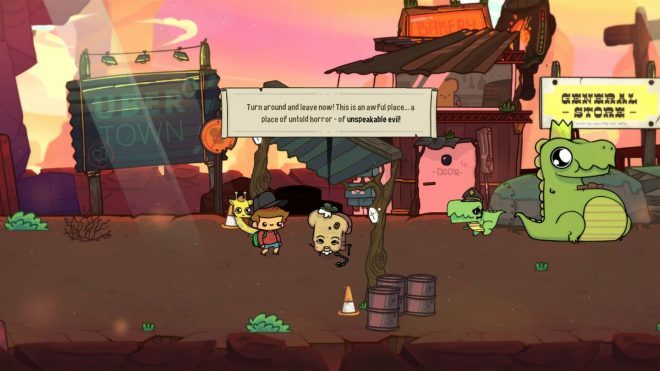 The Adventure Pals Review: Adventure Time! Have you ever asked yourself what three words can mean complete and utter happiness? 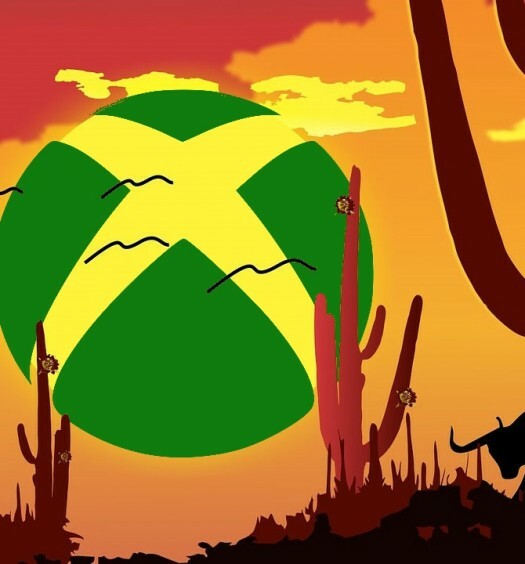 If the words child, giraffe or hot dogs come to mind, then look no further then developer Massive Monster’s newest game. 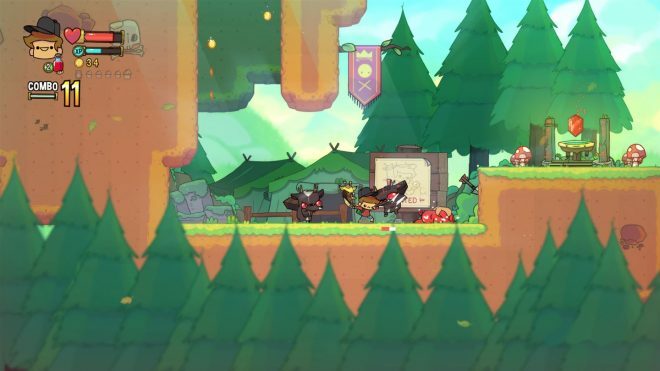 The Adventure Pals is an Action Adventure RPG with light platforming. You play as Wilton, a boy who on his birthday finds himself on a quest to save his papa from the evil Mr. B, whose evil diabolical plan is to turn all the old people into hot dogs. Armed with a sword, a giraffe named Sparkles and a pet rock, Wilton pursues Mr. B destined to save the world. The design of The Adventure Pals is simple. From the start, you’re asked to complete a level. Each level contains five sub-stages. Some stages ask you to simply run from the start to the end. Others have an objective required to complete, such as collecting mission specific items or leading a character through a level. There are some interesting side tasks that revolve around collecting cupcakes and seeking out the 1 sticker pack hidden in at least one sub-stage of a level. You will need to guide Wilton through 5 different worlds each with 5 different levels and an optional arena to test your skill to earn a prize. As Wilton defeats enemies and advances, he will level up and gain access to new and interesting abilities to help the player. Lengthy – From the start, The Adventure Pals feels fun and exciting. By the third world, you really start to wonder how much further the game can go without starting to feel repetitive. The game is a decent length, but not so much to the fact that it feels like the story is being dragged on. The Adventure Pals does it’s best to fight monotony by changing up the levels. Something as simple as adding a water world or how the level progresses helps it to continue to feel fresh and interesting. Collecting all the cupcakes and stickers as well as mastering the five arenas the game has to offer help the overall play time as well. Humorous – With a game that revolves around a kid, you’d expect something different than a serious story. With the Adventure Pals that’s exactly what you’re going to get. Despite the fact that his papa has been kidnapped and the fate of all the old people in the world is at stake, it doesn’t stop Wilton from having a good time or joking with other characters. The game even pushes further to try to be funny with puns. Some are a hit; others miss their target entirely. Even some of the enemies and the bosses offer some form of comedy. There never seems to be a dull moment. Choices – The game interestingly offers a variety of choices throughout your play. 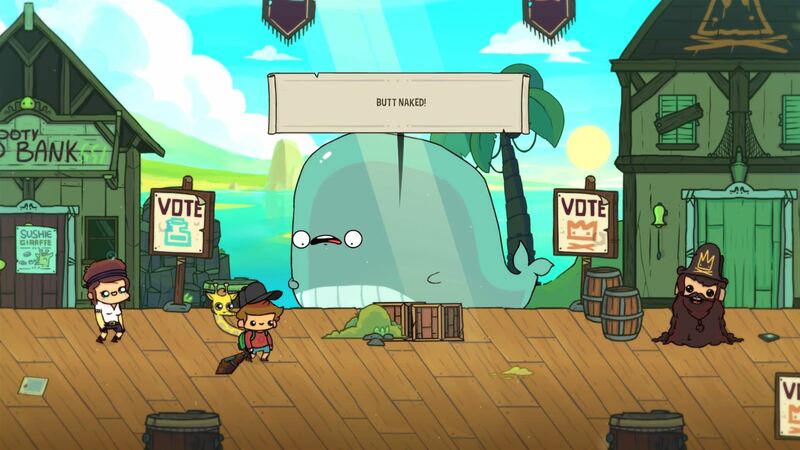 Many different areas of the game give you the option to choose either between two different things or between a variety of different choices. The 21 total levels your character can gain from defeating enemies in combat also give you the choice of what skill you wish to unlock after each level up. In some of the worlds, you unlock multiple levels. Granted they all need to be completed, but you can do them in any order you wish. It really helps the game to not feel as linear as it might appear. Item Variety – The strongest aspect of the game revolves around the various items at your disposable. Healing potions come in a small and large size. They can be found in chests throughout the levels as well as purchased in various stores. It heals your character. There are various bombs you will come to unlock. Starting with basic bombs, you’ll eventually get ahold of sunshine bombs which turn enemies into different rabbits among other things. Poison bombs poison your enemies. Sticky bombs stick to an enemy they are thrown at and are most useful against bosses that are constantly on the move. Cluster bombs are similar to the basic bomb except offer a few more explosions. The most useful item the game has to offer comes from an invincibility potion. When consumed this potion gives you a short 30 seconds where you’re immune to all enemy damage. These potions can be very useful during the optional arena’s, and during the last fight in the game which can be a little frustrating if you’re not properly prepared. Knockdown – In some of the later levels, the game starts to play a little more unfairly. If it wasn’t enough for you to be in an area with six or more enemies, some have the ability to knock you down. When you’re knocked down, enemies are able to walk over your body. If an enemy is touching Wilton as he is getting up, it will immediately knock him down again. It can be so aggravating to the point that it doesn’t even give you a fighting chance and results in a death and voiding an A+ rating for a level. This is definitely the time when the invincibility potions mentioned earlier come in handy. The only way of knowing when it’s time to use one comes from trial and error, unfortunately. No Reward for Perfection – Every level in The Adventure Pals will offer a rating once the level is completed. The prerequisites that determine the rating you will get come from the time it takes to complete the level, enemies defeated, total deaths during the level and collectibles earned. Completing a level without dying and collecting all cupcakes and the sticker pack will give you an easy A+. Dying once will immediately drop the rating to a B. It’s unknown how low the grading scale goes. Unfortunately, it’s worth noting that the rating scale for the levels is pointless. Achieving an A+ in every level doesn’t offer any additional content or a secret ending for your perfection. 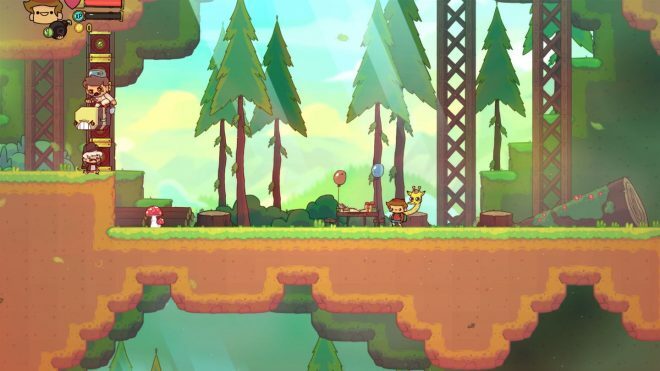 The Adventure Pals is as interesting and quirky as you might expect it to be. Trying to stop a madman from turning old folks into hot dogs itself is a silly concept but will still keep you wondering how it will wrap up in the end. Even the endgame takes the game in a totally different direction and continues to add to the silly nature. The large replay value of the short levels helps answer the puzzling question of collecting everything and completing all the game has to offer. Even despite a few combat issues and no reward for complete perfection, The Adventure Pals is definitely a game worth experiencing! 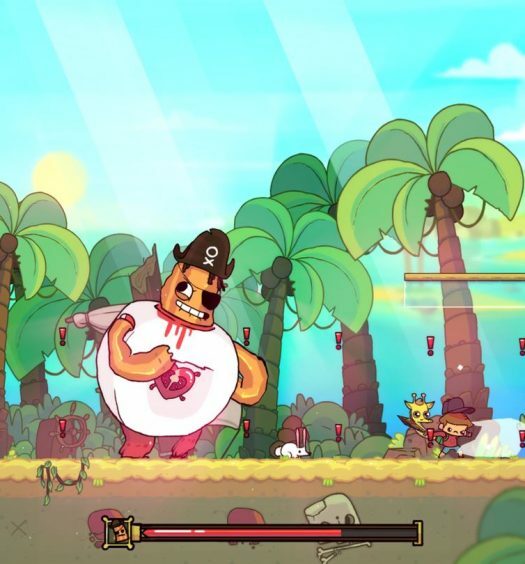 The Adventure Pals was developed by Massive Monster and published by Armor Games Studios. The game released on 4/3/2018 for $14.99. A copy was provided for review purposes.